It’s been a while since our last update. We are alive and well. As many of you know Facebook has become the “Go to Place” for information about our Dutch Oven Group and our Dutch Oven Gatherings schedule. 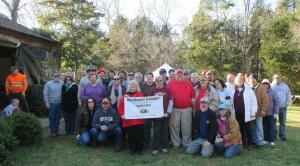 We met on February 6th for our Cabin Fever Dutch Oven Gathering to kick the year off. The weather cooperated with us for a nice partly sunny day that hit the mid 60’s. The week before had us worried as it poured pretty dang hard. The Southeast Camper Cabin Fever Dutch Oven Gathering attracted over 50 cooks and guest with 38 recipes made in our cast iron black pots. The menu was abounding with everything you could want; nobody goes away hungry. Our next event is the first weekend in April. 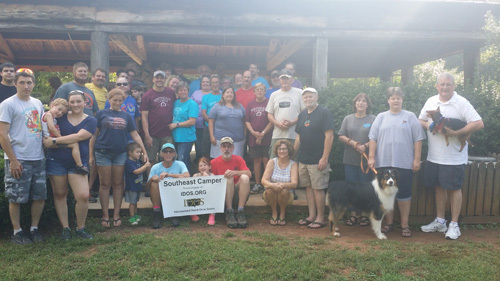 The Southeast Camper Dutch Oven Group (Charlotte, NC) will hook up with The Old Dominion Iron Chefs (Richmond, VA) for the NC-VA 2 state DOG. We will be camping at Jordan Lake in the Parkers Creek Camping Area, Loop 2. We will have a Pot Luck Dinner Friday Night with the Big DOG Saturday at Shelter #1 in the Seaforth Area. We like to meet about 8 am for a Meet’n’Greet along with breakfast. A few with make snacks and test recipes during the day. The main buffet will be at 4 pm right at the shelter. Afterwards we will have a drawing for some door prizes. Get your gear ready along with your favorite recipe for an afternoon of outdoor cooking fun and fellowship. We hope to see you at a Dutch Oven Gathering around the Carolina’s.